​WASHINGTON (AP) — President Barack Obama on Thursday celebrated his hometown Chicago Blackhawks for winning another Stanley Cup, calling the team's third title in six years an "amazing championship run." But he's still hoping one of the Windy City's other professional teams, including his beloved Bears, will earn a trip to the White House before his presidency ends. "Now you've got the hat trick, so I think it's pretty clear the kind of luck I've brought to this team," Obama said, surrounded by players in the East Room. Chicago won its third title in six seasons by defeating the Tampa Bay Lightning in six games last June. Its previous titles came in 2010 and 2013. An avid sports fan, Obama credited the team's strong performance to the front office. "It is also, by the way, a tribute to the head of scouting, who just told me that he could help me pick my Supreme Court justice," Obama joked. "He volunteered. He said 'I know what I'm doing.'" Obama noted that seven players participated in all three championships, but singled out "unsung heroes" in goalie Scott Darling and Kimmo Timonen. 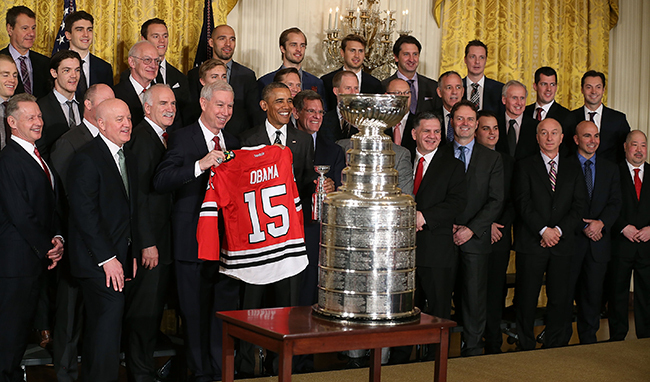 "Thank you for the good work that you are doing as an organization, on and off the ice," Obama said. "It would be nice ... if you just squeeze one more in there before I leave, because then I definitely will take credit for this amazing championship run. I haven't given up hope on the Bulls or the White Sox or the Bears. Heck, I'd even take the Cubs." Obama is a White Sox fan. Obama said it was the best gift he'd ever received at the White House and joked that "I might sell this on eBay."